Coronado’s made-from-scratch ice cream, sorbet and yogurt served in freshly made waffle cones. 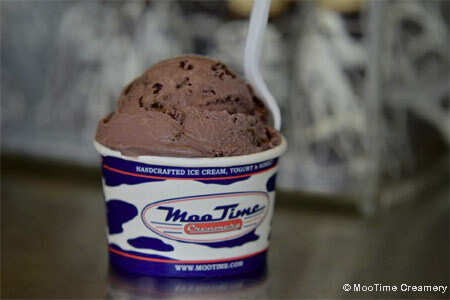 : MooTime Creamery handcrafts its ice cream, yogurt, sorbet and sherbet, and has a large variety of “mixers,” including fresh fruit, nuts and candy, which can be selected to make a personal creation. Choices are served in cups or fresh hand-rolled waffle cones, waffles cups or chocolate-dipped cones. Fun flavors include chai tea, espresso, Mexican chocolate, Girl Scout mint and horchata. Also available are pre-made or made-to-order ice cream cakes and pies. A sister location resides at Hotel Del Coronado.